Definition: Pulmonary-renal syndrome (PRS) is a symptom complex with simultaneous involvement of the kidneys and lungs. PRS is associated with a high rate of morbidity and death. It is almost always a manifestation of an underlying autoimmune disorder. The term was first used by Goodpasture in 1919 to describe the association of respiratory and kidney failure. Pulmonary-renal syndromes (PRS) are not a single entity but are caused by a wide variety of diseases, including various forms of primary systemic vasculitis (especially Wegener’s granulomatosis and microscopic polyangiitis), Goodpasture’s syndrome (associated with autoantibodies to the alveolar and glomerular basement membrane) and systemic lupus erythematosus. PRS is less commonly a manifestation of immunoglobulin A (IgA)-mediated disorders, such as IgA nephropathy or IgA–associated vasculitis, and of immune complex-mediated renal disease, such as essential mixed cryoglobulinemia. 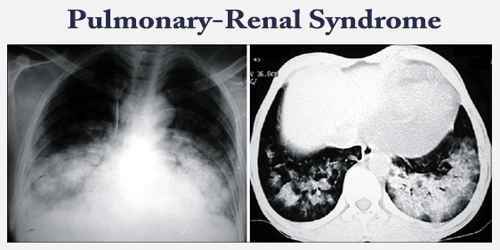 Causes, Sign, and Symptom of Pulmonary-Renal Syndrome: Pulmonary-renal syndromes are most commonly caused by an underlying autoimmune disease. The majority of cases of pulmonary-renal syndrome are associated with ANCAs, either c-ANCA or p-ANCA, due to autoantibodies against the target antigens proteinase-3 and myeloperoxidase respectively. Microscopic polyangiitis is the most common cause of pulmonary-renal syndrome. 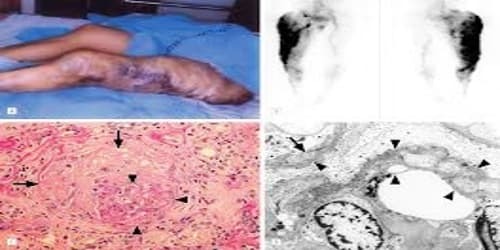 Other causes include systemic lupus erythematosus, eosinophilic granulomatosis with polyangiitis, microscopic polyangiitis, dermatomyositis, polymyositis, mixed connective tissue disease, post-streptococcal glomerulonephritis, rheumatoid arthritis, and systemic sclerosis. Less common causes also include IgA vasculitis and cryoglobulinemic vasculitis. Many causes of the pulmonary-renal syndrome have been defined, and therapy is directed at the underlying etiologic factor for the syndrome. Patients may also have other signs of glomerulonephritis. 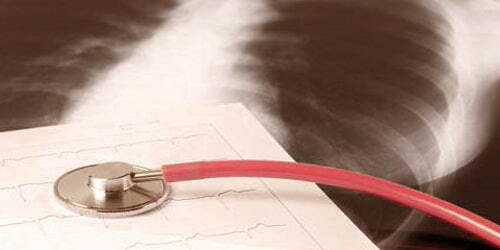 Pulmonary and renal manifestations can occur weeks to months apart. Diagnosis and Treatment of Pulmonary-Renal Syndrome: Pulmonary-renal syndrome is suspected in patients with hemoptysis not obviously attributable to other causes (eg, pneumonia, carcinoma, bronchiectasis), particularly when hemoptysis is accompanied by diffuse parenchymal infiltrates and findings suggesting renal disease. Initial testing includes urinalysis for evidence of hematuria and red cell casts (suggesting glomerulonephritis), serum creatinine for renal function assessment, and CBC for evidence of anemia. Chest x-ray is done if not yet obtained. Cardiogenic shock can mimic a pulmonary-renal syndrome and lead to coughing up blood due to pulmonary edema and kidney failure from inadequate blood flow. The diagnosis rests on the identification of particular patterns of clinical, radiologic, pathologic and laboratory features. Serologic testing is important in the diagnostic workup of patients presenting with a pulmonary-renal syndrome. Immunosuppression is the cornerstone of treatment of pulmonary-renal syndrome. Standard induction-remission regimens include pulse IV methylprednisolone (500 to 1000 mg IV once/day for 3 to 5 days). Treatment is primarily by corticosteroids and immunosuppressive medications like cyclophosphamide, methotrexate, and azathioprine. Plasmapheresis can be used in some circumstances.